Do you hanker for a time when European Power Metal didn't feel the need to infuse everything with pipes, choirs and orchestras? Well my guess is that Sweden's Veonity do, for those tropes are expertly sidestepped with their second album 'Into The Void'. Harking back to an early Gamma Ray sound and bringing the sense of fun (if not frivolity) that the likes of Gloryhammer or Twilight Force have in recent years, Veonity – a name made up by combining the words vision and eternity (I'm not sure that actually works...) – get their message across with just two guitars, drums, bass and a microphone (okay, and a few keyboards). That doesn't stop their pounding pummel from being grandiose and proud. Actually it accentuates it, huge chanted choruses and darting guitar solos given the room to breathe without being ganged up on by all manner of Classical shenanigans. Veonity also pretty much avoid the lyrical clichés that have littered Power Metal over the years, this being an involved story centering around one man's escape from a dying Earth and heads out into space on the epic journey of a lifetime. To be fair, it's hardly a unique tale and yet with the music fitting the scene perfectly and impressive album art and videos backing the whole thing up, 'Into The Void' is a well-rounded and realised concept. Vocalist Anders Sköld is hugely impressive when utilising his low end rumble and mid-range howl, although it would maybe be fair to suggest that his ear piercing screams, of which there aren't that many, may just be an acquired taste. Combined to the scything guitars he and Samuel Lundström lay down, the effect is impressive indeed. Some of the choruses do lack the real power-punch that would elevate this band right to the top end of the genre and yet, with the volume cranked up, 'Solar Storm' takes few prisoners while 'When Humanity Is Gone' is an unashamedly heads-down romp. In all honesty, apart from the short atmospheric spoken word track 'Insanity', that pretty much covers the Veonity gamut. So while variety may be at a premium, quality most certainly is not. 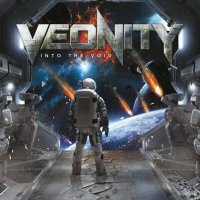 Fans of early Helloween, Freedom Call and GR take note, Veonity are here to whisk you back to a simpler, more powerful time.